'1785 #303' Recently Remodeled 30A WaterColor Vacation Rental Steps from WaterColor Beach Club + FREE BIKES! Great places to eat on 30A with gulf views. Fun outdoor Bar and Grill right on the Gulf of Mexico. 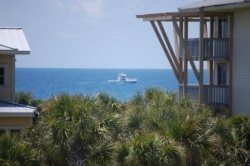 It`s located in Seacrest Beach in the High Pointe Resort. Important Note in regards to getting to Crabby Steve`s... High Pointe is a gated community so if you are not staying there, you`ll need to access it via the beach. Simply walk over to it from the beach and walk up the stairs. Overlooking the Gulf of Mexico in the heart of Seaside, Florida, Bud & Alley`s has been a popular gathering place since 1987 for good food, good people, good times. A pioneer of the fish- and farm-to-table food movement, the award-winning menu features Gulf coast classics paired with Southern-style cuisine. The sunset celebrations on the rooftop bar overlooking the Gulf have been a hallmark traditions for nearly 30 years. Lunch and dinner are served daily in gracious indoor and outdoor dining areas and on the roof terrace overlooking the Gulf. 723 Whiskey Bravo is the type of place that instantly lifts spirits. The energy is palpable and there are plenty of reasons to get happy about the Seagrove establishment. Since its debut in the spring of 2012, the restaurant has truly taken off, quickly becoming known as a local hot spot with its hangout described as �Cool. Casual. Coastal.� Just a short walk from Seaside, beach-goers relish an open-air lunch on The Roof, a sprawling rooftop patio stamped with a vibrant plane on one white wall, painted by local artist Andy Saczynski. Patrons also crowd around the outdoor bar below a canopy modeled after the inside of an airplane hangar. Grouped seating and cozy bonfire pits make the upstairs area a popular choice for lingering with friends and family. The nightly sunset viewing fills the space as diners sip and savor the colorful cloud show. Stinky�s Fish Camp is setting a trend on the Emerald Coast of Florida. Fun, cool and comfortable, Stinky�s is a Seafood & Wine Bar that you just won�t want to leave.Only the freshest ingredients and local seafoods are used to create classic dishes, with a well thought out wine list that is based on taste, not price, to round out the experience. With two waterfront locations on the Emerald Coast, come by with your friends and hang out with us! Please peruse our savory menus with your event in mind. Our menu packages are easily tailored or customized for the perfect pairing of food and fellowship. Please call our Catering Director to discuss your desires thoroughly. She will work with you to plan all the details, and our well-seasoned staff is positioned to provide a seamless flow of mouthwatering fare.